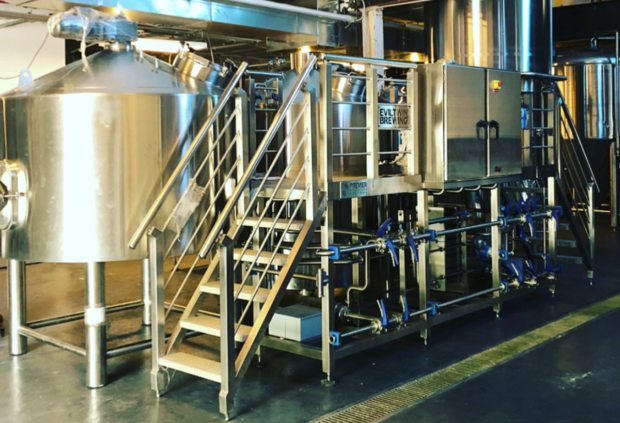 Craft beer fans will be happy to hear that after two years of setback, Danish gypsy brewer Evil Twin will have its first permanent home here in Ridgewood. Evil Twin Brewing, the Danish cult-favorite beer brand owned by Jeppe Jarnit-Bjergso, is set to finally open its own brick-and-mortar brewery here in Ridgewood after two years of setbacks and delays. The space, located at 16-16 George Street, is a former banquet hall boasting 10,000 square feet of production space and over 4,000 extra for an outdoor area and taproom. This outdoor area will also house a permanent food truck by Fette Sau, the Williamsburg BBQ bosses. Corey Gargiulo, general manager of Evil Twin Brewing in NYC, tells Bushwick Daily: "We are still planning on a November opening and are progressing nicely with our buildout. Our courtyard and greenhouse taproom should provide a truly unique experience for a NYC brewery. We aspire to be a local gathering place and are excited at the potential of being a community space for all Ridgewood and Bushwick residents, beyond just the beer community." Evil Twin was founded in 2010 and has operated as a "gypsy brewer" up until now, meaning it contracts other breweries around the world to produce Evil Twin recipes in their spaces. Bjergso helped open Torst in Greenpoint, which is owned by his wife. The restaurant is one of the only places to drink Evil Twin on tap, often pairing beers with dishes at the restaurant. Despite Danish roots, Evil Twin wants to establish itself as a New York Brewery. The opening fans the flames of an infamous rivalry between Evil Twin and Mikkeller. Mikkeller Brewery is a West Coast favorite owned by Mikkel Borg Bjergso. The two Bjergsos are identical twins and business rivals. Mikkeller opened its first East Coast brewery in Queens earlier this year. Although in different neighborhoods, the pair will have to duke it out for the title of borough favorite. Check back for more updates on the official opening! Evil Twin will be a welcome addition to the expanding Queens brewery market. Danish gypsy brewer Evil Twin's first brick and mortar location with taproom and food. Follow Evil Twin Brewing on Facebook, Instagram and Twitter.